Following a brilliant 18 lap contest at the Pirelli Aragón Round Jonathan Rea (Kawasaki Racing Team) maintained his 100% record so far in 2017, taking full advantage of a late crash for Chaz Davies (Aruba.it Racing – Ducati), whilst Marco Melandri (Aruba.it Racing – Ducati) and Tom Sykes (Kawasaki Racing Team) completed the podium. Rea made it five wins from five this year after putting pressure on provisional race leader Davies for most of the race, with Ducati’s Welsh rider crashing out at the penultimate turn of the penultimate lap. The victory puts Rea 47 points clear of Sykes at the head of the championship. Melandri was another beneficiary of Davies’ unfortunate crash as he crossed the line in second, the Italian outpacing Sykes as the pair battled for prominence. Sykes’ third place in the race moves him up to second in the general standings. Alex Lowes (Pata Yamaha Official WorldSBK Team) secured an excellent fourth place finish, ahead of Michael van der Mark (Pata Yamaha Official WorldSBK Team) who completed the top five. Jordi Torres (Althea BMW Racing Team) was the best Spanish finisher in sixth, with Leandro Mercado (IODARacing), Eugene Laverty (Milwaukee Aprilia), Stefan Bradl (Red Bull Honda World Superbike Team) and Nicky Hayden (Red Bull Honda World Superbike Team) all in the top ten. Bradl did well for ninth after technical problems earlier in Tissot Superpole 2. Ayrton Badovini (Grillini Racing Team) retired early in the race due to a technical problem with his Kawasaki ZX-10R. Xavi Fores (BARNI Racing Team) was forced to stop in the final stages due to a technical problem which caused his Ducati Panigale R to catch fire. It was an disappointing end to Fores’ race after he had remounted and battled on having crashed early on when fighting for fourth with Sykes at turn 1. Leon Camier (MV Agusta Reparto Corse) was 11th and Markus Reiterberger (Althea BMW Racing Team) did well for 12th after starting from pit lane due to an issue before the race. 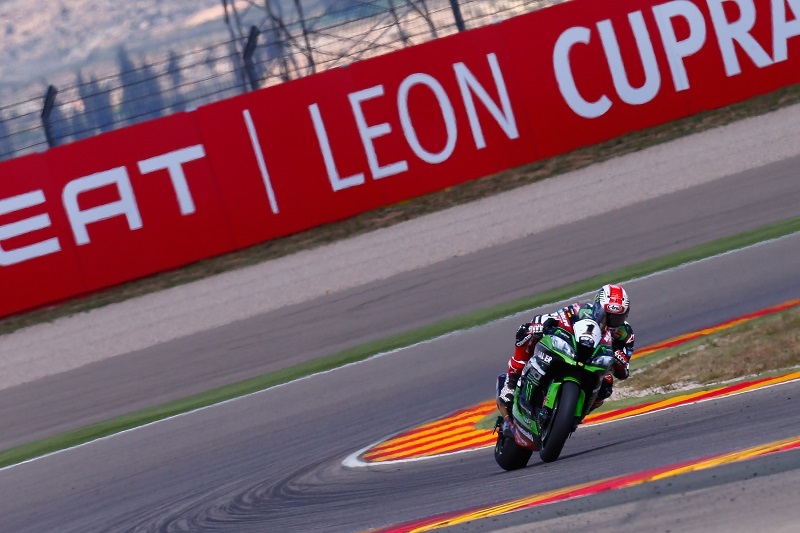 Sunday’s WorldSBK Race 2 at the Pirelli Aragón Round will commence at 1pm local time (GMT +2).